Mowers Direct Announces Best Semi-Pro Lawn Tractors. Recommendations Based on Sales History and Expert Reviews. 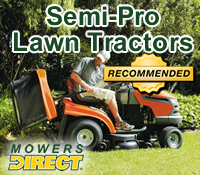 Today MowersDirect.com announced its recommendations for the best semi-pro lawn tractors. "On a semi-pro tractor, you'll be riding in comfort while mowing your lawn with precision," said Todd Gwaltney, resident product expert at Mowers Direct. "The combination of comfort and performance features makes these the pinnacle of homeowner lawn tractors." Since its inception in 2008, the Web-only superstore has put together a collection of mowers unrivaled anywhere. Mowers Direct now carries more than 400 models of mowers, tractors and lawn tools from the top brands such as Ariens, Honda, Husqvarna, Snapper and Toro. MowersDirect.com has sought to become the online authority for lawn tractors, mowers and yard tools. The product experts at Mowers Direct have tirelessly tested and researched all the models to determine which ones stand out. After weighing all the field tests, product research, and customer insights, the product experts recommended only 3 semi-pro lawn tractors. In addition, Gwaltney personally wrote recommendations for all the semi-pro lawn tractors that made the grade. MowersDirect.com hopes to provide customers with enough information and expert insight to allow them to pick the perfect semi-pro lawn tractor for their mowing needs. Power Equipment Direct operates 10 niche online superstores. In addition to MowersDirect.com, the Bolingbrook, IL-based company operates AirCompressorsDirect, ChainSawsDirect, ElectricGeneratorsDirect, LogSplittersDirect, PressureWashersDirect, SnowBlowersDirect, SumpPumpsDirect, TillersDirect and WaterPumpsDirect.